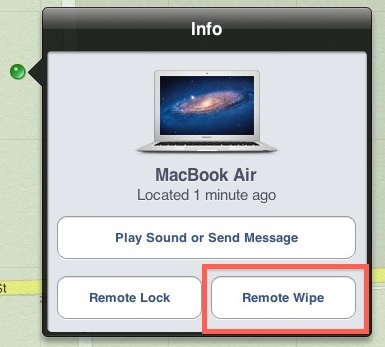 In an extreme situation, say a Mac is lost or stolen, you can remotely wipe the Mac of all its data and contents with the help of iCloud. 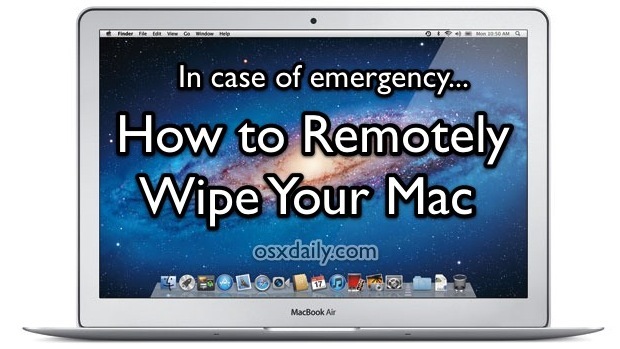 Remotely wiping a Mac goes a step further though and not only removes all data from the computer, but locks it down so that it’s unusable without a set passcode, plus displays a message you provide. This is excellent anti-theft protection, and even if you never end up using it, it’s good to know how to do. 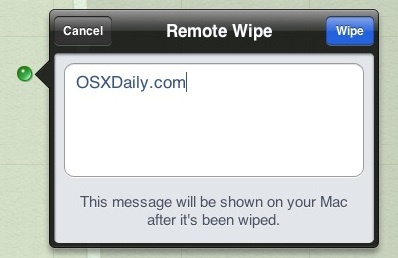 If you meet the requirements, here is how to use the remote wipe feature. The Mac will be wiped clear of personal data and become essentially useless until the passcode has been entered. This rates up there with some of the best anti-theft software available, and considering that iCloud and Find My Mac is completely free to use, there is no reason to not have this setup in case of emergency. It should be noted this is not a reasonable approach to simply formatting a Mac hard drive, which is best done locally with the Disk Utility application. For more remote control fun, remember that you can sleep a Mac remotely through email or SSH too. It’s less dramatic, but perhaps more practical on a day to day basis. If I would stole a Mac (btw be sure that I will not), the first think that I shall do is to deactivate the wifi connection, and I shall not connect to the internet. You would be surprised how stupid they can be (or should I be surprised about you?)! That was funny. However, to turn off the wifi and (not connect to the internet) suggests you actually plan to turn on the machine first, which immediately puts the machine at risk for being wiped. However, it seems the most logical thing to do would be to simply swap the hard drive first for your own. Game over. Actually, this happened to me in December. I activated that (and it got through in January, the first time that thing went online). But, did you get your device back? Guys, If I would stole a mac the first think that I shall do is to deactivate the wifi connection. After that I could connect an external hard drive and steal every file the computer has… And finally, I would formatting the hard drive with disk utility BEFORE even this computer go online… SO ? What’s the point ? Can someone help me ? A smarter person would remove the storage device from the newly found machine, put the “disk” into an external USB case, then plug it into another computer and have instant access to any data you desire. Then copy what ever you want off that external “disk”- and done. Format the “disk”, replace back into the original computer, install the OS and you now have a new machine and access to any data off the old machine. Physical access “is” everything……. Of course you could do many of the same things to gain access to the data to attempt to discover who the owner of the computer is, then notify them you have their machine. And of course the owner would be so happy- he.she will give you a handsome reward for the return of their computer. Say $300 bucks since they are not cheap? That is, unless you encrypt the hard drive. Then hooking it up to another machine to harvest the files won’t work out so well for you. Good point about the encryption. However, I’ve come to discover most of the Mac users I know are college students, who ironically, don’t think such things through very well.